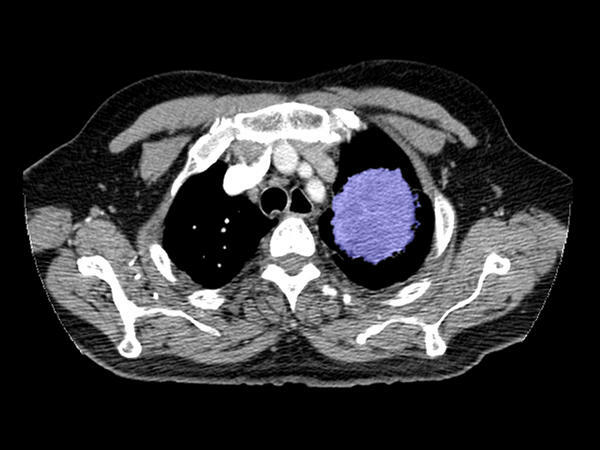 This spiral CT image of the chest shows a large malignant mass (purple) in one lung. A conventional chest X-ray could have missed this tumor, radiologists say. Dr. Andy Lazris, an internist in Columbia, Md., isn't enthusiastic about using spiral CT scans to look for lung cancer in his patients. "Not many people are going to benefit," he says. (Left) Dr. Andy Lazris' analogy of the number of lung cancer deaths averted with annual spiral CT scans (black rectangles), compared to the total number of scans done. (Right) The black rectangles, or "filled seats," represent the number of scanned patients who would receive false-positive test results. Medicare's decision was partly a response to a 2011 study showing that screenings with the technique could reduce lung cancer deaths by 20 percent. That translates into thousands of lives each year, says Dr. Claudia Henschke, a radiologist who heads the lung and cancer screening program at New York's Mount Sinai Medical Center. "It's a tremendous step forward," she says, primarily because lung cancer is such a big killer. The disease claims more than 150,000 lives in the U.S. each year, more than the next three cancers — breast, prostate and colon cancers — combined. But as more and more people are getting screened for lung cancer, other doctors worry the test is doing more harm than good. "It's the two-edged sword," says Dr. H. Gilbert Welch, a professor of medicine and health policy at the Geisel School of Medicine at Dartmouth. "The scans can see very early cancers," Welch says, "but [can also] find cancers that were never going to matter." That's because some cancers grow slowly and never become dangerous, he says. Welch describes this phenomenon in his new book, Less Medicine, More Health: 7 Assumptions That Drive Too Much Care. Welch says spiral CT scans also detect a lot of things that are not cancerous. Nearly a quarter of the 2011 study's participants had multiple tests that showed abnormal growths in the lungs that turned out not to be cancer. These false-positive tests led to more follow-up testing, including risky procedures like a biopsy, which inserts a needle into the lung. "Not surprisingly," Welch says, "sometimes that creates problems like causing someone's lung to collapse." Welch is not claiming that that 2011 study, known as the National Lung Screening Trial, was bad science. A panel of independent experts called the U.S. Preventive Services Task Force reviewed the data and determined that, overall, using the CT screening to find lung cancer does more good than harm. But Welch is concerned that the results of the study will not be replicated in the real world. In the study, he says, the radiologists were highly skilled at detecting lung cancer from a CT scan. The doctors were cautious, he says, and went to great lengths to avoid invasive tests like biopsies. Plus, the researchers clearly explained potential risks to patients, including the high rate of false positives. In everyday medical settings, Welch says, that won't always be the case. "There are real reasons to be concerned that the harmful effects of the screening might actually be greater in practice," he says. In other words, the net benefit of CT screening might not exist in the real world. Dr. Andy Lazris is an internist and primary care physician in Columbia, Md., and says his practice includes a lot of older smokers. He has looked carefully at the data and is not enthusiastic about using CT scans to look for lung cancer in his patients, most of whom are over 55. "Not many people are going to benefit," he says. "A lot of people are going to get these false alarms and a lot of people are going to get excessive testing and potential harm." To help his patients understand the odds, he shows them a picture of a theater seating diagram. 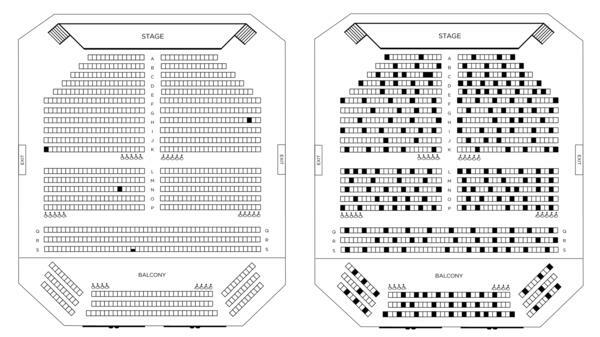 "Out of a thousand seats in the theater, there are 3 1/2 blackened seats, which are barely visible," he says, pointing at the diagram shown on the left. "These are lung cancer deaths averted with spiral CT.
Then Lazris turns the page to another diagram, shown here on the right. "This is a crowded theater," he says. "Out of a thousand people, 233 people will have persistent false positives." These false-positive results lead to further tests, he says, which means more exposure to potentially dangerous radiation and the risk of complications. There can be additional costs, adding to the stress of thinking you might have cancer. Lazris says he shows the theater diagrams to many of his patients and gets a wide range of responses. Some patients, he says, point at one of the three blackened seats and say, " 'That's probably me. I'm not taking any chances, I'm getting this test.' "
"Other people," he says, "will see [the same diagram] and will say, 'Are you kidding me? I'm not going for that; that's not worth it.'" But in either scenario, Lazris says, he has done his job — he has helped his patients understand the odds and then let them make the choice. Medical centers that screen Medicare patients are required to report their results to the government. Officials will be assessing each center's performance and tracking patient outcomes to determine whether screening with spiral CT — when expanded to a much larger scale — is doing more harm than good. Meanwhile, Dr. Henschke suggests that patients who are considering getting the screening remember a couple of things. First, they should discuss the benefits and risks with a primary care physician, she says. Medicare requires doctors to meet with patients before writing a referral, so patients should be sure they take advantage of this opportunity. Also, Henschke says, patients should get the spiral CT done at a facility that has plenty of experience in screening people for lung cancer — "a place where you have a team of people who are aware of what early lung cancer looks like." Today in Your Health, we're going to look at two screening tests for cancer and the costs of those tests. We begin with lung cancer, which is the No. 1 cancer killer in the world. Smokers are at the highest risk. Last February, Medicare began paying for some long-term smokers to be screened for the disease. Yet as lots of people get tested, there's a worry a lot more screening will do more harm than good. NPR's Anders Kelto reports. ANDERS KELTO, BYLINE: It's really hard to detect lung cancer. Dr. Claudia Henschke, a professor of radiology at the Icahn School of Medicine in New York's Mount Sinai Hospital, says for years, the only tools doctors had were chest x-rays and the phlegm patients cough up. CLAUDIA HENSCHKE: But unfortunately, they did not find the disease early enough. KELTO: Regular x-rays can only see cancers when they're about the size of a quarter, and by then, it's often too late. But eventually, doctors began using something called a spiral CT scan to look for lung cancer. And Henschke says these high-resolution scans are much better. HENSCHKE: You can see a nodule on a CT scan that's 2 millimeters or even 1 millimeter. That's tiny. That's much smaller than a grain of rice. KELTO: This got cancer researchers pretty excited. Then in 2011, a study showed that spiral CT scans could reduce lung cancer deaths by 20 percent. 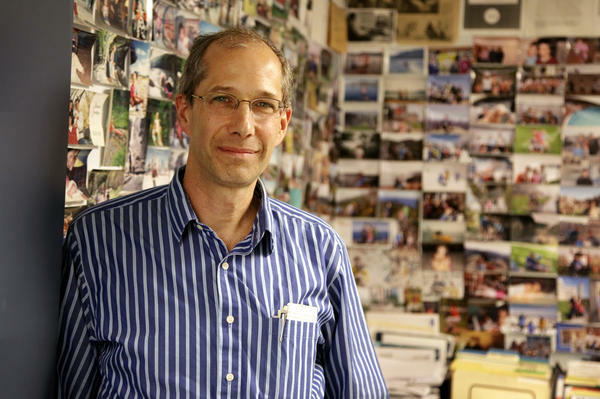 That, Henschke says, translates into thousands of lives a year. HENSCHKE: Because lung cancer is such a big killer in the U.S. and worldwide. KELTO: But Dr. H. Gilbert Welch, a professor of medicine and health policy at Dartmouth, says there's a major drawback to these scans. H. GILBERT WELCH: It's the two-edged sword. It can see very early cancers, but it could find small cancers that were never going to matter. KELTO: Many cancers grow slowly and never really become dangerous, he says. And more often than not, the things that CT scans find aren't cancerous at all. In the study, 1 out of every 4 people had tests that came back positive for cancer when the person didn't have cancer. For some people, that led to risky follow-up tests like biopsies, where a needle is inserted into the lung. WELCH: Sometimes that creates problems, like causing someone's lung to collapse. KELTO: Now, Welch isn't saying that the lung study was bad science. A large panel of experts reviewed the data and determined that, overall, CT screening does more good than harm. They gave it a B rating on an ABCD scale. And because of that rating, Medicare and insurance companies now pay the full cost of the test for certain smokers. People age 55 to 77 who have smoked the equivalent of a pack a day for 30 years are eligible. That's millions of Americans. But Welch's concern is this; the radiologists in the study were highly skilled. The doctors were cautious and clearly explained the risks of the test. But in everyday medical settings, he says, that won't always be the case. WELCH: The harmful effects of screening might actually be greater in practice. KELTO: In other words, the net benefit of CT screening might not exist in the real world. Dr. Andy Lazris sees a lot of aging smokers. He's a primary care doctor in Columbia, Md. He's looked carefully at the data and is not enthusiastic about using CT scans to look for lung cancer. ANDY LAZRIS: A lot of people are going to get these false alarms, and a lot of people are going to get excessive testing and potential harm. KELTO: To help his patients understand the odds, he shows them a picture. It's a theater seating diagram. LAZRIS: Out of these thousand seats of a theater, there are three and a half blackened seats, which is barely visible in the theater, and these are lung cancer deaths averted with spiral CT.
KELTO: Three out of every 1,000 people will survive lung cancer because of the test. LAZRIS: Then if you turn the page and show another theater, you'll see lots of seats are black, and this is a crowded theater. So out of 1,000 people, 233 people will have persistent false-positives. KELTO: False-positives that lead to more tests, which means more exposure to radiation and possible complications from things like biopsies. There can also be extra costs involved and stress. Lazris shows these theater diagrams to a lot of his patients, and he gets a wide range of responses. LAZRIS: Some people, if there's one seat filled that says this is how many people benefit, they'll point to that and they say that's probably me. I'm not taking any chances. I'm getting this test. Other people will see five or six seats filled, they look at me and say, are you kidding? I'm that going for test like that. That's not worth it. KELTO: But in either scenario, Lazris says, he's done his job because he's helped his patients understand the chances and then let them make the choice. Anders Kelto, NPR News, Washington. Transcript provided by NPR, Copyright NPR.